Evidence supporting the book of Abraham continues to turn up in a wide variety of sources. The book of Abraham occupies a mere fifteen pages in the current English edition of the Pearl of Great Price, including four pages of illustrations and explanations. And yet it offers a wealth of knowledge in its clear teachings about premortal existence and foreordination. Consider, for example, the knowledge of heavenly bodies, of the eternal nature of spirits, and of the great council in heaven﻿—in which the plan of salvation was laid out﻿—all packed into just one chapter, chapter 3. Ancient texts sustain the book of Abraham account that there was indeed an attempt on Abraham’s life (Abraham depicted it in facsimile 1). They also verify the names of four idols (detail) and confirm the terminology for the “pillars of heaven” (bottom of facsimile). Intriguingly, Middle Kingdom Egypt saw a great deal of activity in the large oasis to the southwest of modern Cairo known as the Faiyum. Crocodiles were common there, and Sobk (or Sobek) was the chief local deity. The last king of the twelfth dynasty, which may include the period of Abraham’s life, even adopted the name of the crocodile god, calling himself Nefru-sobk (“Beautiful is Sobk”), and five pharaohs of the next dynasty, the thirteenth, took the name Sebek-hotpe (“Sobk is content”). The book of Abraham records that years later, as Abraham is about to enter Egypt, the Lord advises him to conceal the fact that Sarai is his wife and to tell the Egyptians that she is his sister, a term whose broad usage also appropriately identified Sarai. (Abr. 2:22–25.) The Bible records the story of Abraham’s answer but is silent regarding the divine counsel that authorized it. (See Gen. 12:11–20.) 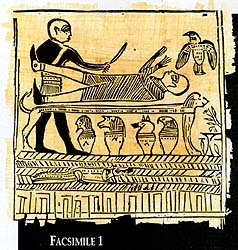 However, the Genesis Apocryphon, a document found in this century among the famous Dead Sea Scrolls, agrees with the book of Abraham that the patriarch’s behavior in this matter was divinely ordained.13 And there was good reason: The crocodile-god/king of the Pyramid Texts, cited above, is portrayed as willful and tyrannical. Specifically, he is said to steal wives from their husbands whenever it suits him to do so.14 That is, of course, exactly what Abraham expected the pharaoh to do to Sarai. The third chapter of the book of Abraham offers a remarkable picture of what might be termed “Abrahamic astronomy.” (Abr. 3:1–17.) The prophet is shown various features of the heavens, including even the great astronomical body Kolob, which “is set nigh unto the throne of God.” (Abr. 3:9.) Recent research indicates that the astronomical model portrayed here fits very well among ancient geocentric (earth-centered) notions.15 It is interesting to note that although nothing in the Genesis account of Abraham’s life suggests that he had any special astronomical interests or knowledge, many postbiblical texts present an image of him that accords with what we are told in the book of Abraham. 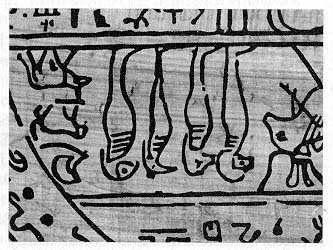 A translation from an ancient source closely matches the Egyptian words found in figures 9 and 10 (detail) of facsimile 2. Critics have long attempted to make a case against the book of Abraham. They argue that some ancient texts do not support the book. They point to the fragments of the Joseph Smith papyri that we now possess and claim that since the contents of these papyri bear little obvious relationship to the book of Abraham, the book is a fraud; but Hugh Nibley has made an exhaustive study of these claims and has shown that the papyri we now have were probably not the ones from which Joseph Smith translated the book of Abraham.29 And recent research into ancient texts continues to give firm support for what the Spirit has whispered for over a century and a half﻿—that the book of Abraham is authentic. Most of us have stared wide-eyed at the fascinating pictures in the book of Abraham and have read with awe this translation by the Prophet Joseph Smith of a record of people and events far distant in time. In addition to the strong testimony of the Spirit, there is now scholarly evidence that these scriptures truly convey ancient teachings about eternity and accurately reflect the antiquity from which they came. I wish to thank William J. Hamblin, John Gee, Michael D. Rhodes, and Melvin J. Thorne for their help in the preparation of this article. Important earlier LDS treatments of some of these topics include John Gee, Ensign, July 1992, pp. 60–62; Hugh W. Nibley, Abraham in Egypt (Salt Lake City: Deseret Book Co., 1981); Hugh W. Nibley, The Message of the Joseph Smith Papyri, An Egyptian Endowment (Salt Lake City: Deseret Book Co., 1975); Hugh W. Nibley, “The Meaning of the Kirtland Egyptian Papers,” BYU Studies, Summer 1971, pp. 350–99; Michael D. Rhodes, “A Translation and Commentary of the Joseph Smith Hypocephalus,” BYU Studies, Spring 1977, pp. 259–74; and various articles on the book of Abraham in the Encyclopedia of Mormonism (New York: Macmillan, 1991). See, for instance, Jubilees 11:4, 7–8, 16–17; 12:1–8, 12–14; English translation in James H. Charlesworth, ed., The Old Testament Pseudepigrapha, 2 vols. (Garden City: Doubleday, 1983–85), 2:78–80; hereafter referred to as OTP. See also Jasher 9:6–19; 11:15–61; Josephus, Antiquities of the Jews, 1.7.1; Apocalypse of Abraham 1–8 [OTP, 1:689–93]; Qur’an 6:75; 9:114; 19:42–51, 21:52–68, 26:70–83, 37:84–97; Macaseh Abraham Abinu, in Adolf Jellinek, Bet ha-Midrasch, 6 vols. (Jerusalem: Wahrmann, reprint 1967), 1:26–27; Kebra Nagast 13, in E. A. Wallis Budge, The Book of the Cave of Treasures (London: Religious Tract Society, 1927), pp. 145–47; Louis Ginzberg, Legends of the Jews, 7 vols. (Philadelphia: Jewish Publication Society of America, 1967–68), 1:209–15; 5:215. For some non-LDS views of the question, see Giovanni Pettinato, Ebla: A New Look at History, translated by C. Faith Richardson (Baltimore: Johns Hopkins University Press, 1991), pp. 24, 28–37, 58–60, 89, 129, 139, 155–56, 159, 168, which presents evidence to indicate considerable Egyptian influence in the general area of northern Syria even before the time of Abraham; Cyrus H. Gordon, “Where Is Abraham’s Ur?” Biblical Archaeology Review, June 1977, p. 20. For Latter-day Saint discussions, with excellent references, see John A. Tvedtnes and Ross T. Christensen, Ur of the Chaldeans: Increasing Evidence on the Birthplace of Abraham and the Original Homeland of the Hebrews (Provo: Society for Early Historic Archaeology, 1985); Paul Y. Hoskisson, “Where Was Ur of the Chaldees?” in H. Donl Peterson and Charles D. Tate, Jr., eds., The Pearl of Great Price: Revelations from God (Provo: Brigham Young University, Religious Studies Center, 1989), pp. 119–36; Paul Y. Hoskisson, Ensign, July 1991, pp. 62–63; John M. Lundquist, “Was Abraham at Ebla? A Cultural Background of the Book of Abraham (Abraham 1 and 2),” in Robert L. Millet and Kent P. Jackson, eds., Studies in Scripture, 7 vols. (Salt Lake City: Randall Book, 1985), 2:231. See Lundquist, “Was Abraham at Ebla?” pp. 233–35; Hoskisson, “Where Was Ur of the Chaldees?” p. 136, n. 44; John Gee, “A Tragedy of Errors,” Review of Books on the Book of Mormon, 4 (1992):115, n. 64; I. J. Gelb and B. Kienast, Die altakkadischen Königsinschriften des dritten Jahrtausends v. Chr. (Stuttgart: Franz Steiner, 1990), pp. 255–56. See Lundquist, “Was Abraham at Ebla?” p. 232; Tvedtnes and Christensen, Ur of the Chaldeans, pp. 32–33. See Rhodes, “A Translation and Commentary of the Joseph Smith Hypocephalus”; John Gee, “Notes on the Sons of Horus” (Provo: Foundation for Ancient Research and Mormon Studies, 1991). See also Apocalypse of Abraham 18, OTP, 1:698. See, for example, Adriaan de Buck, The Egyptian Coffin Texts, 7 vols. (Chicago: University of Chicago Press, 1935–61), 61 I 263; Adriaan de Buck, Egyptian Reading Book (Leiden: Nederlands Instituut voor het Nabije Oosten, 1963), 53.15, 57.10; Dieter Arnold, “Pfeiler,” in Wolfgang Helck and Hartwig Altenmüller, eds., Lexikon der Ägyptologie, 7 vols. (Wiesbaden: Harrassowitz, 1977–89), 4:1008–9; Heinrich Balez, “Die altägyptische Wandgliederung,” Mitteilungen des deutschen Archäologischen Instituts in Kairo, 1 (1930):57–62. Erik Hornung, “Himmelsvorstellungen,” Lexikon der Ägyptologie, 2:1216. Miriam Lichtheim, Ancient Egyptian Literature: A Book of Readings, 3 vols. (Berkeley: University of California Press, 1975–80), 1:40. Lichtheim, Ancient Egyptian Literature, 1:201. John Gee, “References to Abraham Found in Two Egyptian Texts,” Insights: An Ancient Window, September 1991, pp. 1, 3; John Gee, Ensign, July 1992, pp. 60–62. 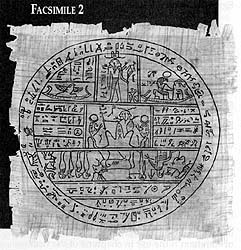 For a discussion of the incident, see Thomas W. Mackay, “Abraham in Egypt: A Collation of Evidence for the Case of the Missing Wife,” BYU Studies, Summer 1970, pp. 429–51. Compare Papyrus D’Orbiney 10.4–12.4, in Georg Möller, Hieratische Lesestücke, 3 vols. (Leipzig: Hinrichs, 1927), 2:11–13; translation in Lichtheim, Ancient Egyptian Literature, 2:207–8. Josephus, Antiquities of the Jews, 1.7.2. Testament of Abraham 9–10 (OTP, 1:886–88). Jubilees 12:16–19 (OTP, 2:81); Qur’-an 6:76–80; Macaseh Abraham Abinu, in Jellinek, Bet ha-Midrasch, 1:26–27. See Apocalypse of Abraham 12, 15–24 (OTP 1:694–701). The quotation is taken from 19:9, as translated by R. Rubinkiewicz in OTP, 1:699. Apocalypse of Abraham 12 (OTP, 1:694–95). Abu Ja’far Muhammad b. Jarir al-Tabari, Jami’ al-Bayan fi Tafsir al-Qur’an, 30 vols. (Beirut: Dar al-Ma’rifa li al-Tiba’a wa al-Nashr, 1978), 7:160; compare Abu ‘Abd Allah Muhammad b. Ahmad al-Ansari al-Qurtubi, Al-Jami ‘li Ahkam al-Qur’an, 8 vols. (Cairo: Dar al-Sha’b, n.d.), 3:2459. It is likely significant that the classical Arabic accounts of Abraham’s vision, following Qur’an 6:76–80, use the same Semitic word for “star,” kawkab, that is used in the book of Abraham. (See KokobandKokaubeamAbr. 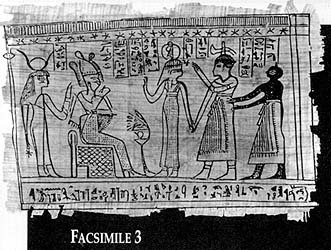 3:13; compare also facsimile 2, figure 5.) Abu al-Fida’ Isma’il b. Kathir al-Qurashi al-Dimashqi, Tafsir al-Qur’an al-’Azim, 4 vols. (Aleppo: Maktabat al-Turath al-Islami, 1980), 2:151 even has to explain the authentically Arabic kawkab by means of its synonym najm, with which his medieval readers were evidently more familiar. Josephus, Antiquities of the Jews, 1.8.1–2. Eusebius, Praeparatio Evangelica, 9.17.8; 9.18.1–2 (OTP, 1:881–882). The original author is generally called Pseudo-Eupolemus. R. Doran, in OTP, 2:873, dates his activity to sometime prior to the first century B.C. The apocryphal book of Jasher, 15:22, also has Abraham invited to the palace of the king of Egypt and treated with great honor. Al-Tabari, Jami’ al-Bayan, 7:160. The Apocalypse of Abraham 21–25 (OTP, 1:699–702) represents the patriarch as receiving a vision of the Garden of Eden, of the fall of Adam and Eve, and of the wickedness of Cain. “Timothy of Alexandria,” Discourse on Abbaton, 7a–21a, in E. A. Wallis Budge, Coptic Martyrdoms (London: British Museum, 1914), 479–488; Atramhasis I, 1–339, in W. G. Lambert and A. R. Millard, Atra-Hasis: The Babylonian Story of the Flood (Oxford: Clarendon, 1969), pp. 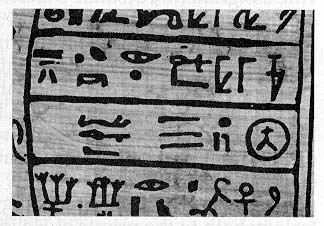 42–67; Shabako Stone, in Lichtheim, Ancient Egyptian Literature, 1:52–57. B. W. Anderson, “Creation,” in The Interpreter’s Dictionary of the Bible, 4 vols. and supplement (Nashville: Abingdon, 1962–76), 1:728. See Gerhard May, Schöpfung aus dem Nichts: Die Entstehung der Lehre von der Creatio Ex Nihilo, Arbeiten zur Kirchengeschichte, 48 (Berlin: Walter de Gruyter, 1978); Jonathan A. Goldstein, “The Origins of the Doctrine of Creation Ex Nihilo,” Journal of Jewish Studies, Autumn 1984, pp. 127–35; David Winston, “Creation Ex Nihilo Revisited: A Reply to Jonathan Goldstein,” Journal of Jewish Studies, Spring 1986, pp. 88–91; Peter Hayman, “Monotheism﻿—A Misused Word in Jewish Studies?” Journal of Jewish Studies, Spring 1991, pp. 2–4; Frances Young, “Creatio Ex Nihilo: A Context for the Emergence of the Christian Doctrine of Creation,” Scottish Journal of Theology, 44 (1991):139–51. See Nibley, “Judging and Prejudging the Book of Abraham” (Provo: Foundation for Ancient Research and Mormon Studies, 1979); Nibley, The Message of the Joseph Smith Papyri, pp. 1–55; and Nibley, “The Meaning of the Kirtland Egyptian Papers,” Brigham Young University Studies 11 (Summer 1971):4, pp. 350–99. Daniel C. Peterson, an assistant professor of Arabic at Brigham Young University, serves on the high council of the BYU Eleventh Stake.